The traditionally loved fall flavor appears to have grown in popularity to a point where it is a constant presence, even in items that probably shouldn’t be pumpkin spiced (we’re looking at you, pumpkin spice Pringles)—from the classic morning pumpkin spiced latte, to a decadent pumpkin spice Oreo cookie, the retail market seems to be embracing pumpkin madness without reserve. And according to Panjiva, authoritative information source on global trade, shipments of pumpkin items have been increasing over the last several years, climaxing this year at 4,338 shipments, the highest since Panjiva starting tracking the data in 2008. In an analysis of the descriptions on bills of lading forms (i.e., trade slips from U.S. Customs) of shipments labeled ‘pumpkin,’ Panjiva found a steady increase in pumpkin shipments, supporting that pumpkin and pumpkin flavoring is more present in the U.S. than ever before. 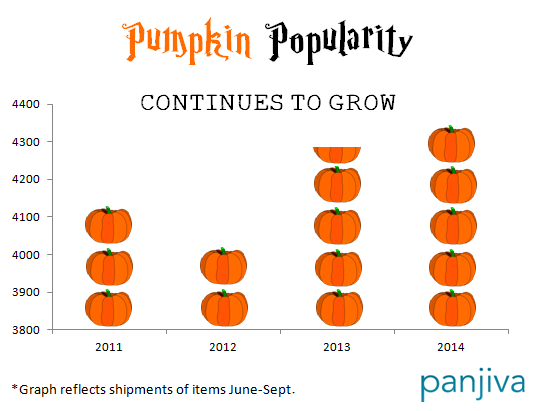 The graph below shows the increase in pumpkin shipments from June to September over the last four years. On a side note, I have no fewer than four pumpkins sitting on my front porch…and I may be having a pumpkin ale when I leave work this afternoon.